Some might ask what vampires have to do with solar energy generation, but anyone who has played Wonderville’s Solar Energy Defenders game knows they try to stop kids from getting to the school dance. On September 17, 2016, the MindFuel-created online game came to life; kids of all ages visited MindFuel’s Beakerhead installation and did some hands-on science. 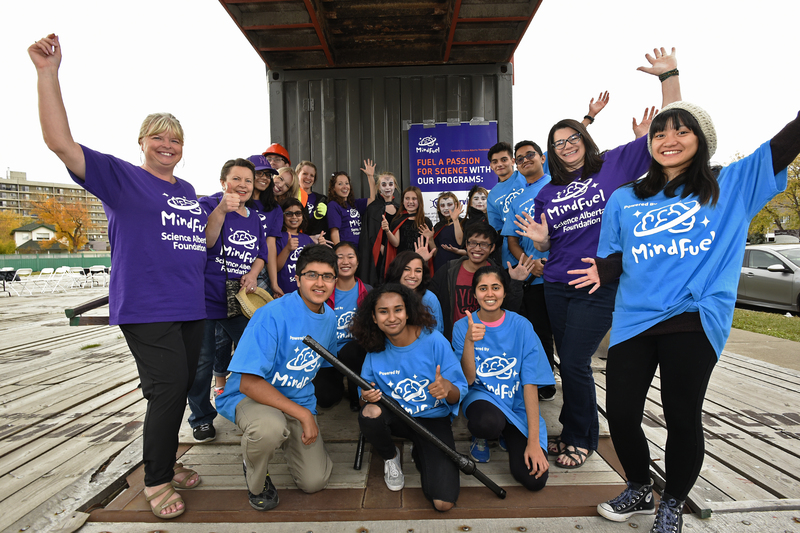 Using the pop-up containR space in Calgary, MindFuel volunteers hosted close to 200 visitor experiences. Participants toured the solar-powered shipping container on site – aka – the “Wonderville Power Generation Station” and learned how energy is generated and how it attracts troublesome vampires. Visitors were then equipped with a “vampire vanquisher” light to defend themselves. They had to combine light, mirrors and angles to reveal and banish the hidden vampires that were trying to stop them from getting to the “school dance.” Those who successfully made it past the “real” scary creatures completing the timed course got to play the real Solar Energy Defenders game at the dance. They could also pedal the electricity bike, which powered a music speaker and a bubble machine from their kinetic energy. Special thank you to our staff, volunteers and partners who played important roles in making our Beakerhead installation a success. “The MindFuel activation proved that learning about solar energy is amazing and interesting to all ages when made accessible like this. Enjoyed the mix of interactive and online activities,” said Kayla. “MindFuel is doing a pretty cool thing; it’s awesome to see kids getting involved in science,” said Jenna.